Save lives by making sure hazard ratings are accurate and easily understood with the Spanish NFPA 704. 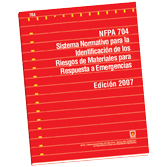 The 2007 Spanish edition of NFPA 704: Standard System for the Identification of the Hazards of Materials for Emergency Response presents a system to simplify determining the degree of health, flammability and instability hazards of chemicals. The system also provides for the recognition of unusual water reactivity and oxidizers. The NFPA 704 ratings are displayed in markings that are commonly referred to as the "NFPA® hazard diamond."